Want a big new tank but not a fan of spending a load of extra money on upgrades? 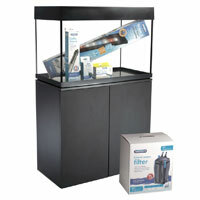 Tri-Spec 2 Fully Loaded kits come with all the high-spec gear that you would need to set up your dream aquarium. Want to recreate a lush river biotope or looking to grow a stunning reef? The super bright Tri-Spec 2 LED light paired with a Tri-Spec app controller allow you to have high-intensity light in just the right spectrum range to meet the needs of nearly any plant or coral species. 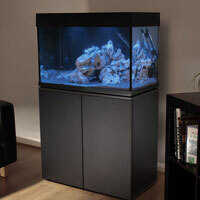 Big aquariums need serious filtrations and thats why Interpet developed the EF1 external canister filter. It provides multi-stage filtration, helps maintain pristine water quality and reduces cleaning frequency. Also included in the Fully Loaded kit are a reliable Deltatherm heater and New aquarium start up kit to help you quickly and effortlessly cycle your new aquarium. 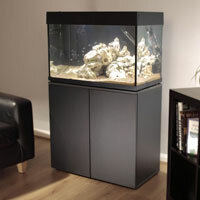 If that is not enough, the matching cabinet is free and the aquarium and lighting come with a 3 year warranty. Available in 166L, 170L (cube), 210L and 250L versions.